You found an old guitar in your attic or basement and you’re wondering what it might be worth. A guitar’s value depends on a number of factors such as age, condition, rarity and the prominence of its users. Unless you’ve got a trained eye, you won’t be able to tell the difference between a vintage model guitar and a regular reissue. You need to be able to properly identify exactly what sort of instrument you have. That means looking at things such as the material, serial number, workmanship, finishes and woods. These are all possible indicators of its true value. Look carefully at the guitar’s physical condition. Are there scratches, cracks or other signs of wear and tear? What about the neck and fret? Are they in good shape? Are there any blemishes on the guitar? A truly vintage guitar will have little sign of wear and tear. Have there been any alterations to the guitar? If an instrument still has it original parts despite a few scratches, it is still worth more than if it were refinished. The more of its original makeup a guitar retains, the better. How does the guitar sound? The guitar’s note should be clear and crisp. If it doesn’t then that would significantly diminish its value. Depending on what is affecting the guitar’s sound the problem could be fixed without making any significant alterations or affecting the value. As alluded to earlier, the material of the guitar affects its value. If it is made of a material that is rare or no longer used, then that would greatly enhance the value of the instrument. Certain materials such as rosewood, irony and ebony will enhance your guitar’s worth. Do some online research to make comparisons. Check for similar models and see what prices they sell for. Sites like the Blue Book of Guitar Values and the Vintage Guitar Magazine’s Price Guide are good resources to get an idea of what your own guitar might be worth. If you still don’t feel as if you can make a proper assessment, or you think you actually have a valuable guitar, then have an appraisal done. Thi s is the best way to get an accurate measure of what the value is worth. 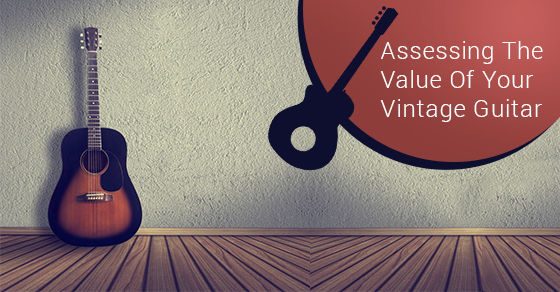 A vintage guitar might be one of a number of valuable items you might have stored in your attic or basement, although it’s best to keep valuable assets in a safe place that will not threaten their worth. Public storage is the best option, as they know how and where to store valuable items so as to preserve their true worth. For more information, contact the team at Jiffy Self Storage today!